Pressing the “Publish” button for this blog post was one of the most exciting, nerve-wracking, and exhilarating things I’ve ever done and is indeed the biggest step forward we’ve ever made with our company. You read the title correctly – we have merged with MyHeritage. While Legacy has a new home – everything is staying the same…just better. In our new home the walls are whiter, the ceilings are taller, and the views are greater. Putting aside the analogies, our Legacy software and webinar series will continue just as they always have. But from this point forward, we now have access to the manpower, financial resources, and a customer base of more than 91 million users. We now have everything we need to ensure that Legacy and our webinars will continue to flourish in the years ahead. Below you will find the official announcement plus answers to questions we thought you would have. 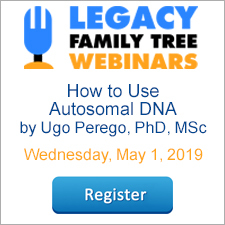 Just as we are excited to contribute to the success of our new owners at MyHeritage, they, too, are anxious to elevate our Legacy software and webinar series to levels that have been beyond our reach. Click here to get Legacy software or webinar membership at 50% off. Thank you all for your continuing support as we enter this exciting new chapter in the Millennia story. Q. Is this a friendly or hostile acquisition? A. Friendly, in every way. Both parties were keen on doing it and consider it a great combination. MyHeritage is interested in expanding its services to the Legacy users; and after operating independently for 20 years, Legacy is interested in the stability, financial security, and expanded technical resources that MyHeritage provides. Q. Why did Legacy sell to MyHeritage and not to someone else? A. The Legacy founders Dave, Ken and Geoff saw MyHeritage as a perfect fit, a company that shares their vision and care for genealogy. Another potential buyer, Ancestry.com, shut down their Family Tree Maker product, later found a buyer for it in Ukraine, and then sold it off. We wanted to ensure that our future partner had as much care for our software and our customers as we do. MyHeritage believes that genealogists deserve to be cared for and continues to maintain and improve its own desktop software, Family Tree Builder. They were the best fit. Q. What happens with the Legacy Family Tree team after this acquisition? A. MyHeritage is retaining the entire Legacy team and giving them better terms so they could focus on improving Legacy. No more accounting and payroll for Dave! No more server maintenance headaches for Ken! They can now concentrate fully on improving Legacy without the countless distractions a small business has to cope with. Just like Geni -- MyHeritage acquired Geni 5 years ago, and many of the original Geni team members are still on board today and have been happily improving Geni ever since. Q. Is MyHeritage acquiring Legacy Family Tree in order to kill it? A. No. 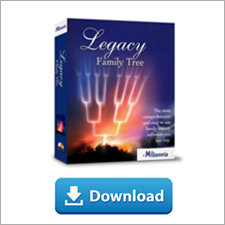 Legacy Family Tree will continue and is already planning together with MyHeritage the next version, Legacy 10. Q. What will Legacy version 10 include? A. It's still being planned but one of the contemplated features will be a tool to optionally to sync trees with a private or collaborative tree using the MyHeritage tree platform. Q. Will Legacy version 10 support Unicode?A. Sadly, no. That would require a complete rewrite of the Legacy software from scratch and such a rewrite is not planned. Version 10 will include improvements and features requested by users, not inside-out changes. Q. Will Legacy users enjoy any benefits from this acquisition? A. Yes! Legacy users will receive discounts on MyHeritage DNA and MyHeritage subscriptions not available to anyone else, and which have never offered before – anywhere. These will be announced separately next week. Additionally, Legacy is celebrating the news by offering discounts on Legacy 9 to everyone, starting today. Q. What will happen to the Legacy webinars after the acquisition? A. MyHeritage is planning to improve the webinars. For starters, deploy improved infrastructure that allows more concurrent users. MyHeritage will promote the webinars to its own users and increase their audience, and will have more resources to bring on speakers, who will receive more exposure thanks to the increased audience, and higher royalty rates. The webinars will remain as Legacy webinars, managed by Geoff. They will not become a voice of MyHeritage. Although they are expected to include more content about MyHeritage than before, the webinars will continue to include a wide range of topics of interest to genealogists. Q. Is MyHeritage changing things around at Legacy? A. If it ain't broke, don't fix it. This is MyHeritage's approach with Legacy. Minimum changes. MyHeritage did ask Legacy though to stop selling external products unrelated to genealogy such as magnabrite readers, to improve focus. Q. Will Legacy continue to participate in genealogy shows/seminars? Q. Will Legacy operate the cruise promised for 2017? Q. I have another question not listed here. Where can I ask it? A. We'll host a webinar about the acquisition in a few more weeks, and anyone is welcome to join, ask any question and get candid answers. I'm already a huge fan of Legacy and Legacy products/webinars! Congratulations on the merger! Looking forward to what's ahead! Will Legacy now support native Mac version.. That would be the biggest improvement for all of us that use Mac OS. I LOVE Legacy, just not sure about the merger with MyHeritage as I am NOT a satisfied customer with them AT ALL. But I look forward to seeing what can happen, but I am NOT promising anything as MyHeritage just seems to want to 'add' people and not keep things from the public eye. Soooo glad you didn't merge with a.com! Love MyHeritage. I've always felt that MyHeritage, and most certainly Legacy, were much more about supporting and promoting the building and sharing of family history. All the blocks and stops that a.com put up in order to make you pay makes me feel as though they are just about the money! Congratulations and good luck. Only time will tell whether this merger is a good thing - sorry, I am a little sceptical of mergers. I do hope to remain a loyal supporter of this software (still have my copy of Legacy 2) but there are many aspects of MyHeritage that I do not like, despite being an account holder. I'm with Thomas, my one wish is that the Mac version is put on a fast track to release. Congratulations to both Legacy and My Heritage! Robert - yes, this will be an option to transfer this information between Legacy and MyHeritage. Congratulations Legacy. Congratulations MyHeritage. I am very hopeful that this will make both better, which is not something I can say about too many mergers. Looking forward to see improvements in both! A MAC version would be so beneficial to me. Hope we can see that very soon! Dearly love Legacy! Not a fan of MyHeritage. All I've ever found on their website are other people's unsourced family trees. Surely hope this goes well and that you have a rock-solid agreement for this merger. Sounds wonderful for each company and for the consumers to combine resources! Thanks for the great sale too! I look forward to working with Legacy and MyHeritage in providing more quality webinars. Looking forward to my December 27 webinar "Problems and Pitfalls of a 'Reasonably Shallow Search'"
I am concerned about the manner in which My Heritage documents sources. Will this feature be as in My Heritage or will it be like Legacy? I am very careful about documentation and have found My Heritage users to be less than careful, preferring just to "click matches" as opposed to comparing source documents. Ancestry is the ultimate in providing this service. My Heritage needs to adopt a similar method. I frequently copy or copy and paste a document, story with sourcing, or picture to a person in my tree. The info is then there for that ancestor, not just a "source site" where you have to track down the information. I like Legacy and hope they have morfe influence than My Heritage with this merger. Congrats Legacy! Finally we can expect a faster track on the many varied and needed software improvements that many of us have been waiting on for years!! NOW is the time to make our voices heard to the new management and ensure these software issues get top priority! Hi Phyllis - yes, the documentation in MyHeritage has a great start and room to improve. We're looking forward to sharing what we've developed with them as well. Will we now have to pay a membership fee to Heritage to use the site and resources? Please, please make a Mac version of Legacy! I'm on my knees-can you see me? Elizabeth - the MyHeritage site has free and paid resources. You can still use Legacy as you always have though without any additional fees. Does this mean I should hang onto my MyHeritage account? I wasn't that thrilled when they dropped/lost the newspapers records so I was going to drop them come my renewal time. Now, I don't know. I absolutely love Legacy, the support we get from them in the Facebook group, and the webinars. Will I still be able to use/upgrade Legacy even if I don't subscribe to MyHeritage? I like to access MyHeritage, Family Search, and Ancestry but don't keep my tree online. Will this be a problem? Please, please use the capability of storing the data in the cloud as an opportunity for several people in the same family to tie in their Legacy Software to the same cloud data. Imagine if each in the family could automatically have access to the same data base as they do research. We can only dream of this. As long as Geoff keeps moderating the webinars, I'm happy with the merger. Geoff is so upbeat with such wonderful enthusiasm that even if my day isn't going well, his voice immediately makes the day brighter. Happy Birthday early, Jeff! Can we use the Webinar code to get an additional 10% off the wonderful 50% off of the webinar membership? Thanks. Donna - I, too, was bummed when they dropped the newspaper account (a year ago or so?). I've heard a bit about what's coming and for my research at least, it's going to be a big welcome addition. Will this allow Legacy to work with Apple?? Nancy - absolutely! Legacy is still, and will continue to be, a standalone software program. Dennis - I think that dream has potential for reality. But it will only be an optional feature for users. I love the concept as well. I'd like to have PRIVACY with this merger. I don't want any information to be viewable if I mark it as private. That includes the names of pictures that might identify living people. My Heritage makes too much public. I just became a member of Legacy and have been a member of Heritage for quite some time did Ijust waste my money for Legacy as I bought rhe unlocked version so now when my Heritage expires will I have to renew that to? Jan - you really, really made my day with that. Thanks so much! Yes, I'll still be at the reigns of the webinars. I've loved every minute of it the past seven years and look forward to many, many more! Jenny - yes, when we complete the Mac version it will work with Apple. Tammy - nothing will be shared unless you manually, intentionally share it. Yes, privacy is important. Would My Heritage facilitate the transfer from Legacy to its Family Tree builder, including the transfer of any attached document and photo? Larry - no, your Legacy software will not expire, nor will it require you to have a membership to continue to use it. I was contemplating v9 but with v10 coming from myheritage do you think there will be really good prices at that time to "celebrate"? maybe I should wait for v10? Jean-Yves - good question. As long as Family Tree Builder can import a GEDCOM file, which I suspect it could (haven't given it a look yet), then you'd be able to import a Legacy-created GEDCOM into it. Give it a try and let me know how it goes.